The past two weeks has been a perfect storm of distractions, mild if any inspiration, and, most importantly, a Blogger dashboard update that has not gone smoothly. If I finally figure it out there will be one hell of a recall post, but for now I have given up on it. In the meantime, I noticed that it does not look like I have ever discussed garam masala on its own merit. It translates to warm spice mix, and that's exactly what it is. There are no chilies in it, so it is not spicy hot; it just has a lovely blend of aromatic spices that are commonly used in Indian cuisine, such as coriander, cumin, cardamom and cinnamon. Although it can be added at the beginning of a dish along with the other spices that are cooked with the onions, garlic and ginger before adding the rest of the ingredients, they are often added at the end instead, where they provide an extra depth of flavor and, well, warmth. When I first started experimenting with Indian cooking I would just use sweet curry powder whenever a recipe called for it, but after a while I started to wonder how much of a difference it might make so I bought some and discovered that it did have a discernible impact no the dish. After I had accumulated enough of the individual spices that go into the mix as I was learning more about Indian cooking, I realized I could make my own. And I must say, now that I have been using it for a couple of years, that it is well worth seeking out the ingredients just for this purpose. There's nothing like the aroma of spices toasting in a cast-iron skillet on the stove top. Of course, you don't need a cast-iron skillet for this, any small skillet will do, but I purchased this small skillet pretty much for the sole purpose of toasting spices and I love having it. I also use it to toast nuts in the oven. 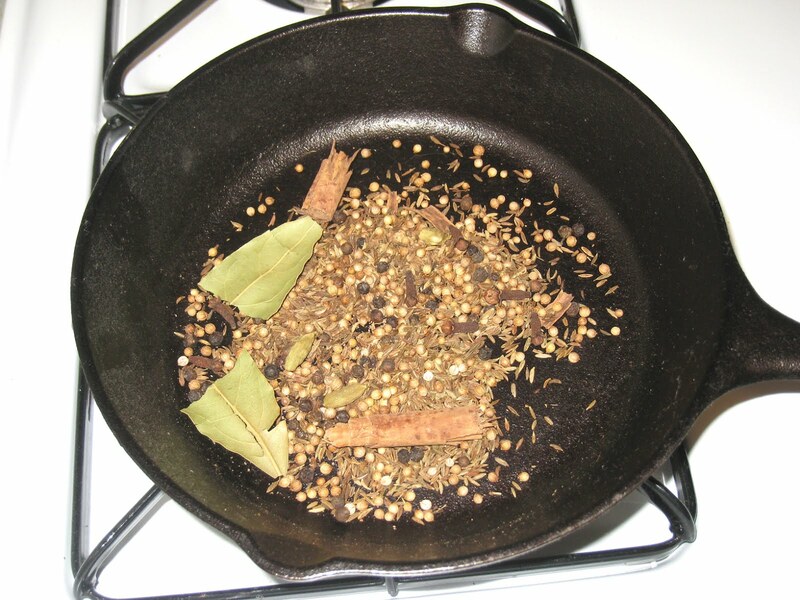 What you see toasting in the skillet here is cinnamon bark, cumin seeds, coriander seeds, cardamom pods, black tellicherry peppers and a bay leaf. I toast them until I can just start to smell them, take them off the heat, add a little bit of ground nutmeg and put them into a small bowl to cool off (if I leave them in the skillet they will continue to cook and might burn so I always empty the skillet immediately no matter what I have cooked in it). After about five minutes they are cool enough to put into my spice blender (I use one an inexpensive coffee grinder I bought years ago and now have dedicated to spices). I grind it into a fine powder and put it in a small jar. It lasts for a few months. 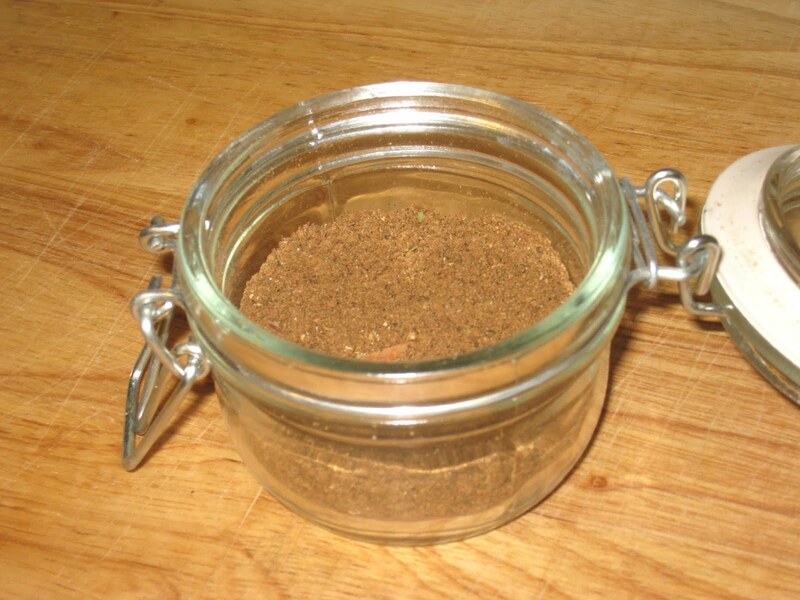 There are as many recipes for garam masala as there are people who make it. I looked at several and came up with my own blend, which I will post here. You should think of it as more of a suggestion than a recipe, though, and adjust the spices to your taste. You don't have to be an expert at Indian cooking to use this. You can add any amount from a teaspoon to a tablespoon at the end of cooking just about any vegetable or bean dish. It's also good with eggs. Heat a small skillet on medium. Add all the spices except the nutmeg and dry roast the spices, stirring constantly. After about 5 minutes, the spices will darken and begin to release a unique aroma. Remove the skillet from the heat, then add the nutmeg. Transfer the spice mix to a bowl and allow to cool for about 5 minutes. 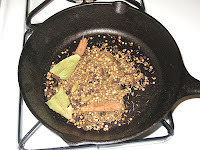 Using a spice grinder, grind the spices to a fine powder. Store in an airtight jar. The spice mixture will keep for up to 3 months. And can I say once again how much I am REALLY NOT liking the Blogger update?